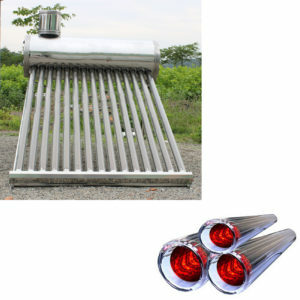 Stainless steel low-pressure solar water heater, 304 stainless steel, and enamel liners are customizable. Cheap and reliable solution, Simple structures, Easy installation. High efficiency of heating,water heated by sun light directly. Operated without any power supplying. Electric heater can be used as back-up in rainy days. Hot water can be used directly, or can be used as a pre-heated. Tank is equipped with electric water heater setting, automatic temperature controller(optional ). the insulating layer uses polyurethane bulk bubble,keep hot water 72 hours. Can he operated completely automatic if connect with intelligent controller. Simple structure, easy plug-in installation, can be installed both on flat and inclined roof, and can be used with an auxiliary electric booster as to provide tot water without sunshine. Superior heat preservation ensured by one-off molding polyurethane foam with thickness 50 65mm. Suitable for camping area, holiday residences. stable and reliable performance, well wind resistance. It meets the human health bathing standards: the inner tank is made of SUS304-2B stainless steel plate or enamel; the silicone sealing ring has a long anti-erosion life and is harmless to health. 1. Sample can be offered with sample charge and courier fee by buyer’s side. Very good, can you place an order now?